Over the weekend, I had the great pleasure of serving on a panel discussing waste disposal and the impacts of human trash on the environment and human and wildlife health. Many thanks to Annie Hooper and Wellfleet Bay Wildlife Sanctuary for inviting me! While we were down on the Cape for our whirlwind, sub-24 hour visit, we stopped by First Encounter Beach in Eastham, MA. This is a bay-facing beach, rather than an ocean-facing one, so it is more sheltered, with less wave activity, and thus, more prone to at least partial freeze-ups. We were surprised to find, however, that the bay was entirely locked in by piled slabs of ice as far out to the horizon as we could see. 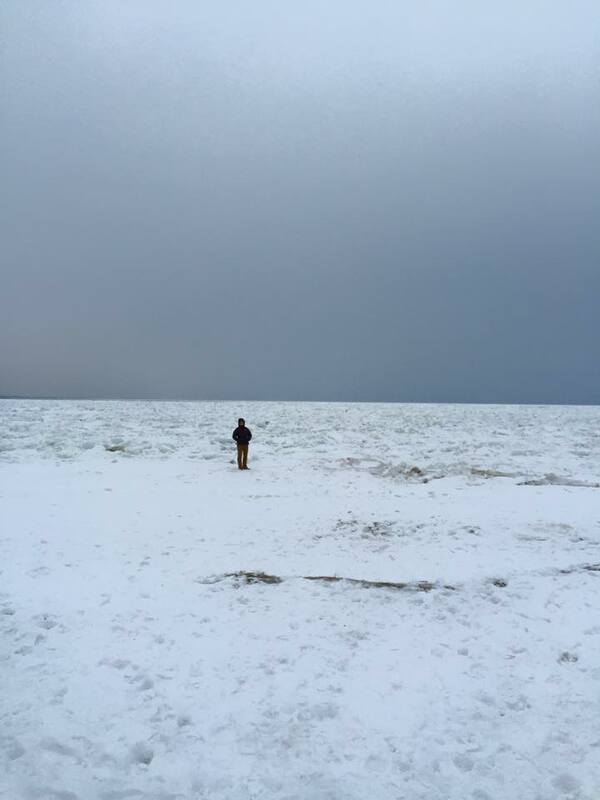 It was not clear where the ice-covered beach ended and the ice-covered bay began. Here’s me at the presumptive edge of the bay. My sons were thrilled, as they are on a mountaineering kick in their reading, and this was the closest they will be getting to a glacial crevasse field any time soon. It was good to get to a beach at all, however ice-covered, as the beach I normally walk in Salisbury, MA has been unreachable for the past month. The mile long road in to the parking lot finally succumbed to the drifting snow this month, and last time I tried to go, I had to give up, and drive my poor Prius in reverse for three quarters of a mile back to the state park entrance when blowing snowpiles made the last reaches impassable. I am hopeful for a walk in March, but we will play it by ear. For the Cape Cod Bay beaches, it’s hard to imagine how any dead bird would ever arrive on the beach, with what looks like miles of ice between the sand and the open water. I have to imagine we will see a downtick in beached birds when we look at the data from those beaches for these latter weeks of winter. Meanwhile, down south, I have a couple photos to share of Seanetter Lori Porwoll. Lori ordered a SEANET shirt from me a year and a half ago, but her check was quite literally lost in the mail. I only recently unearthed it in an unopened packet of mail I found in a closet, and I finally sent her the shirt. 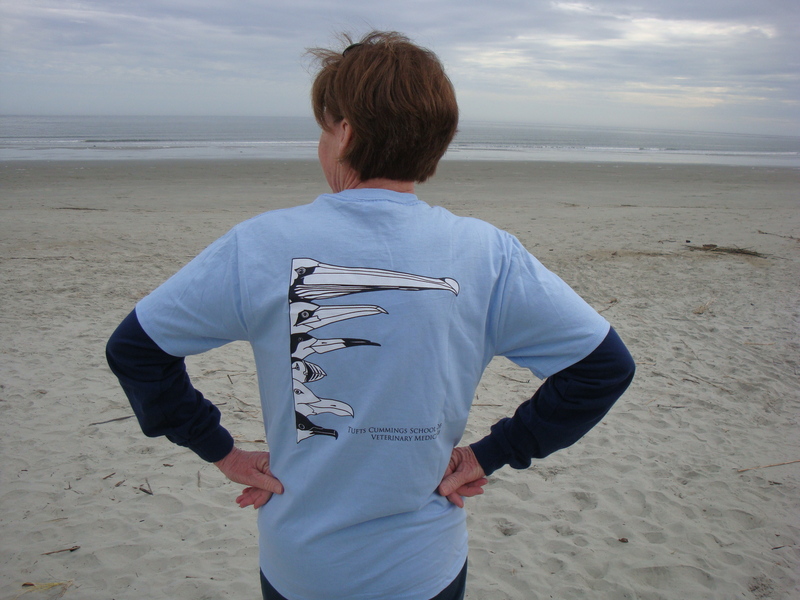 As you can see from the pics, it’s warm enough on Lori’s South Carolina beach to wear the shirt (albeit with a layer underneath). I know it shouldn’t constantly amaze me–the geographic differences in weather–but it always does. In conversation with an acquaintance of mine from Alabama, she asked why hikers and backpackers in New England complain of missing the trail this time of the year. “Why not just go out? A good jacket and some boots are all you really need, right?” I can scarcely convey to her what nine feet of overall snow looks like, nor what it feels like to walk out into -8 degree air this morning to bring water to the chickens. Even my cross-country ski outings have been curtailed this week by severe wind chills. But, as everyone keeps pointing out, “Spring is coming next month!” I can’t argue with calendar spring being close at hand, but right now, the concept of mud season (spring in New England) seems like something I imagined once and have since mostly forgotten. I will be glad to get back out to beach MA_23 at some point. Come to think of it, couldn’t I do a SEANET survey on skis? Hello, dear Seanetters and miscellaneous readers. 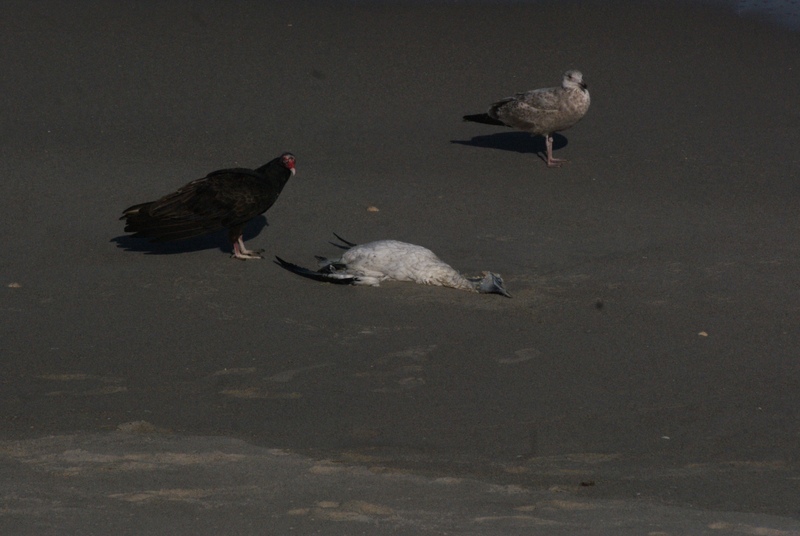 I apologize for the relative dearth of posts lately–having a full time teaching job, as it turns out, really limits the time I have to blog about dead birds. This week, however, I will be finding a bit of time on Saturday to talk about dead birds and trash. 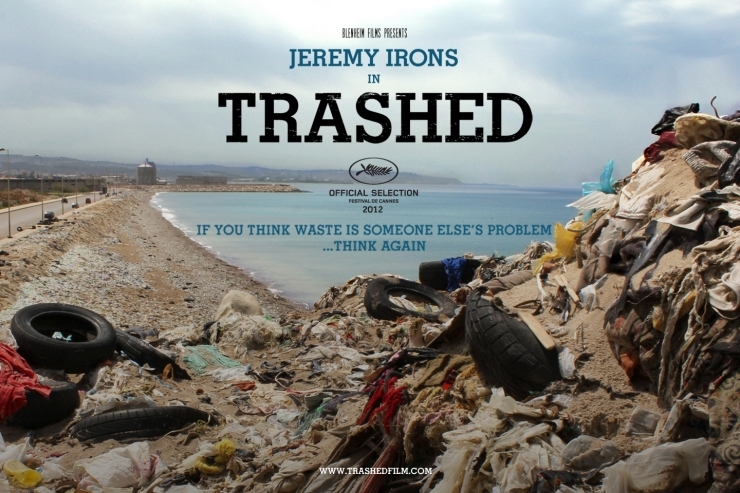 I was very kindly invited to serve on a panel following a screening of the film “Trashed” at the Wellfleet Harbor Actors Theater on Cape Cod. This program is jointly sponsored by Wellfleet Bay Wildlife Sanctuary and WCAI and the Wellfleet Harbor Actors Theater. I am going to try to comport myself as a true Seanetter and do you all proud. If you’re local, perhaps I’ll see you there, and if not, perhaps you may elect to make some popcorn and stream it on Netflix sometime. Wish me luck, and I will see you all back here next week. A Glaucous Gull, of course! The good thing about talking with larophiles is that you can get a quick answer on a bird they feel is obvious. The bad thing about talking with larophiles is that one feels a dope when they all recognize what the bird is immediately and then assume that one is utterly ignorant of all things bird. But, I swallow my pride, for you, dear Seanetters! I posted Jerry’s bird on the North American Gull group on Facebook (members only, though their bar to admission appears so low as to be a simple line painted on the ground), and asked a few other gull-knowledgeable folks. 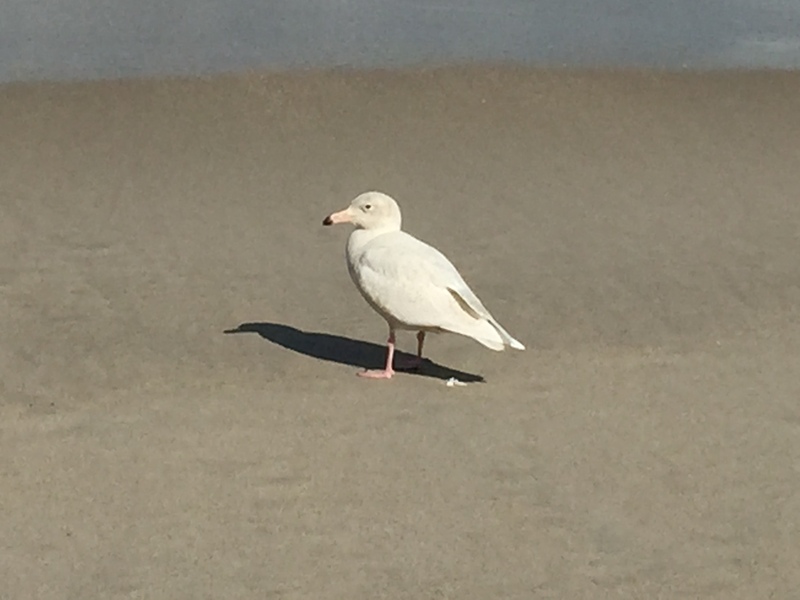 All were in clear agreement that this is a subadult Glaucous Gull. When corresponding with Jerry about the bird, and in reading the comments on the post from Edward and Diana, Glaucous did seem a strong contender, with Iceland Gull in contention as well. Since I am very good at discerning the difference between shredded up remains of common gull species, but quite terrible at identifying gulls I do not see routinely, I had no useful input on this one. After posting to North American Gulls on Facebook, I turned to my Sibley guide, where I found one of my favorite lines. This, in regard to the Iceland Gull: “…round head and short bill, creating a gentle expression.” I help with banding Herring Gulls and Great Black-Backed Gulls, and I think my description of the latter would be, “Fierce eye and glowering, blocky head create intimidating expression,” but that is neither here nor there. 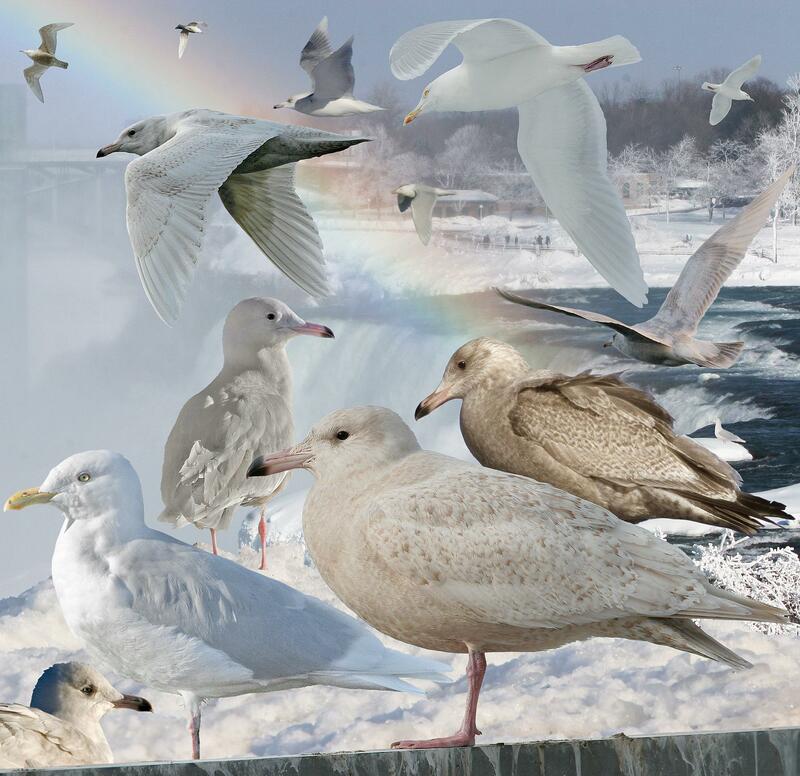 Other characteristics of Iceland Gulls of interest: though the youngsters are indeed very pale, particularly in first summer plumage, their bills seem small for their heads as compared with a Glaucous Gull. GLGU also are noted to have a “slight bulge on the forehead” and the head slopes back overall, actually putting me vaguely in mind of the profile of an eider, or some of the scoters. I’m not convinced I can see that in this bird, but I am pretty convinced by the bill characteristics. The bill on an Icelan Gull is shorter and smaller than a GLGU’s. Jerry’s bird appears to have quite a long bill with an extensive area of pink and then a black tip. In Glaucous Gulls, this is consistent with a first year bird. As the birds age, they acquire a light colored iris (and Jerry’s bird appears dark eyed to me) as well as a pink tip to the bill. The coloration of the back and wing looks extremely pale, but it seems that the photo is bleached out overall, likely due that strong Florida light, unlike anything we’re seeing here in New England these days. If the bird looks paler in the picture than it actually was in life, then it could well still be a 1st year. Glaucous Gull from the Crossley ID Guide to Eastern Birds. I must say, I love this rather trippy mashup of various ages of GLGU plus a waterfall and a rainbow. Front and center is a bird looking very like Jerry’s. It does have more brown flecking than Jerry’s, but there, again, I suspect a trick of the light. You can see the dark iris and the all black bill tip here for sure. Just behind this bird, you can also see the other flavor of juvenile GLGU, which is the color of one day old sanded snow, something like a pale HERG youngster. (We are now describing everything in varieties of snow here. By the end of the weekend, we will have accumulated nearly 6′ in my yard). I am pleased to have learned a good deal about GLGU from this quiz, and will strive to be alert to their presence. I’m headed out for a SEANET walk today. I’m pretty far south to be in a GLGU hotspot, but they are not unheard of, so maybe this will be the day I finally notice one of these guys! Seanetter Jerry Golub sent a picture of *gasp* a LIVE bird for us to consider. What do you think of this one? Apologies for the brevity; it’s another snow day here in New Hampshire and my kids are going stir crazy. Time for some sledding. Edward posted a comment on the last post that I think is quite useful, and thus, I share it here in its entirety. He writes first about the identity of the set of wings featured in that post, and I concur with his assessment that this is a female common eider. 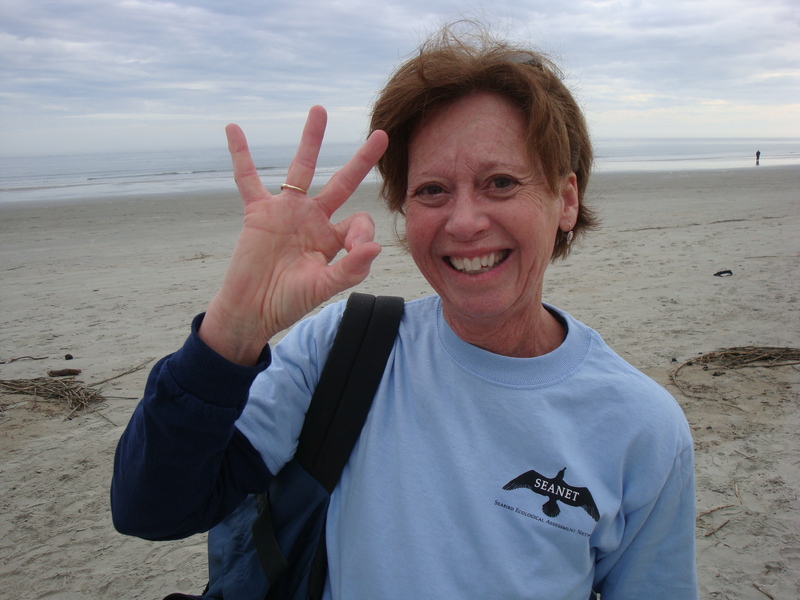 The practice of marking primaries is one common to many beached bird programs, and, in fact, we at SEANET used to utilize that same method. 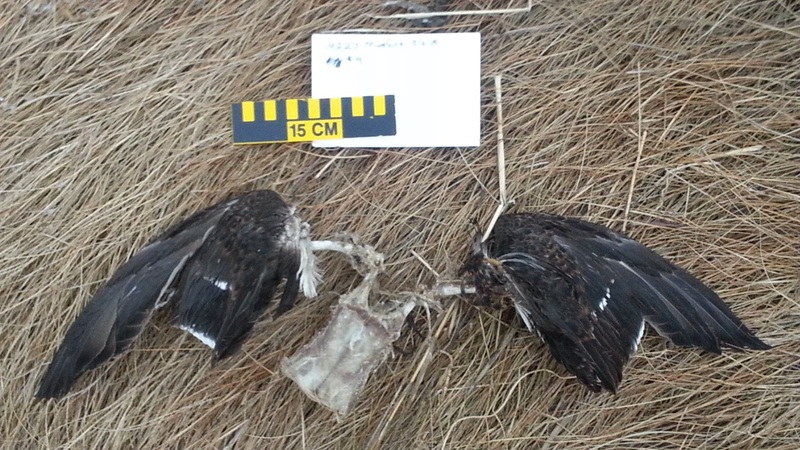 We would prefer not to be putting any plastic out on carcasses of course, but when using the clip feathers method, we found that volunteers were having trouble detecting the cut feathers in subsequent surveys, sometimes because the feathers had not been cut aggressively enough, or because the cut had weathered and was hard to distinguish from normal degradation. It was surprisingly challenging. The bigger issue however, was needing a way to mark other parts of the body. We tried having walkers clip off a toe, but again, if the cuts were not aggressive enough, they were often dismissed as evidence of scavenging on subsequent walks. And we never really found a good way to mark heads and bills. Thus, we arrived at the cable tie method. Gaudy, yes. Plastic, yes. But reliably conspicuous, also yes. And the individually numbered metal tags are the only way to track an individual carcass over time, as we did with this eider. Still, it’s an issue that is a constant poke in the ribs for us. It’s another snow day in New Hampshire, and my kids are pestering me for things, so I shall sign off. But not before I share with you this photo from Jerry Golub.